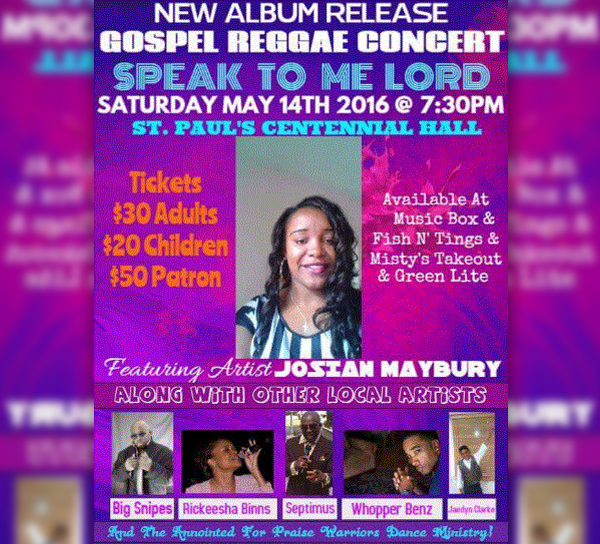 On Saturday, May 14 at the St Paul’s Centennial Hall, Josian Maybury will be taking to the stage with other local artists to celebrate the release of her debut album, ‘Speak To Me Lord’. The show will begin at 7.30pm, with tickets costing $30 for adults, $20 for children 12 and under, ad $50 for patrons; tickets are available at Music Box, Fish ‘n Tings, Misty’s Take Out, and Green Lite. “The concert is being billed as a ‘Gospel Reggae’ Concert but there will be various gospel music genres represented on the evening of the 14th, with artists such as Big Snipes, Rickeesha Binns, Septimus, Whopper Benz, Jaedyn Clarke, & The Anointed For Praise Dance Warriors. “Tickets are $30 for adults, $20 for children 12 and under, $50 for Patrons, and are being sold at The Music Box, Fish ‘n Tings, Misty’s Take Out, and Green Lite.